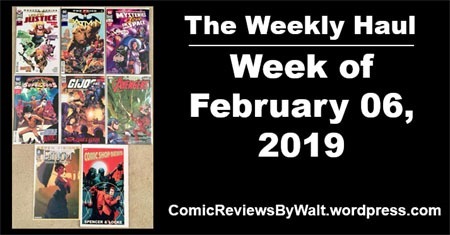 February starts out with a medium week. Not huge, not tiny. Though it’s another with an issue missing from the week before, picked up amidst the bunch! 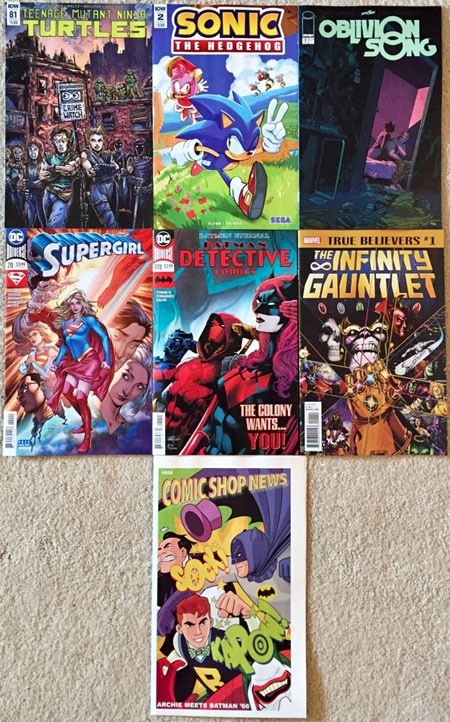 While I despise the $3.99 price point AND that DC is NOT doing digital codes with the books regularly/predictably, I think I’m pretty much ‘sold" on the Wonder Comics stuff, at least for checking out the first issue or two for each of the titles. This week had Young Justice #2, which was a no-brainer for me, given the way I enjoyed the first issue. This one didn’t hit me quite the same way, but was still enjoyable in itself! We get the first chapter of The Price [of Justice] in Batman #64, beginning a 4-issue 2-per-title crossover with The Flash, written by the writer of The Flash (rather than Tom King, the regular on Batman). From the previous week is the $9.99 Mysteries (of love) in Space, a giant-size special playing off the classic Mysteries in Space title. As a sucker for these giant-size issues, I snagged it. Where I’m "ok" with DC doing $10 issues and NOT OK with Marvel is that DC has the decency to have them be standalone issues and NOT part of a regular series. Get the special, don’t get the special…one isn’t "penalized" by a gap in their collection or feeling "forced" to buy the issues! Adventures of the Super Sons is over the halfway point of its run; GI Joe: A Real American Hero sports one of THE highest-numbers in American comics (coming behind Spawn‘s #294 or so) and I’m giving these Marvel Action books a chance, if only for the "novelty" of being major Marvel properties published by IDW (and thus semi-immune to gated/ratioed/EXCESSIVE variants and crappy continuity stuff). Finally, I tend to follow Blake Northcott‘s work, so of course snagged her Aspen Visions: Fathom issue. I think this is a one-shot, but time’ll bear that out, I suppose. I missed the Man and Superman giant-size special, but hopefully it’ll be back in stock this upcoming Wednesday. …Which will itself hopefully not be too huge a week, as I’ve had a couple other huge non-comics purchases within the current paycheck, and another planned for the next! 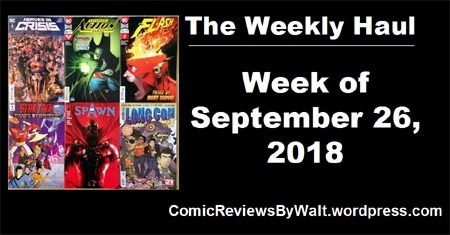 This week’s an interesting week for new comics, particularly for the hype/buildup to DC‘s latest event series, Heroes in Crisis. Well, Sarah says "Hi!" She kicked Heroes in Crisis away from the rest of the issues entirely, but seemed particularly enamored with Star Trek vs. Transformers. So, this week begins Heroes in Crisis. I’d wavered on the issue, and have to admit it was somehow the cover art that pushed me over the edge on it, back to actually buying the issue. Maybe the S-shield on Superman being nice and large. Action Comics has been a gimme for almost 2 1/2 years again; not sure what to think of this one from the cover; we’ll see once I’ve read it. Not too keen on Flash for the cover, and I think I’m iffy on sticking with the title. I’d already let it lapse, jumped back in for the Flash War and I’m not particularly interested with the various "Forces" introduced, nor in a non-Wally Flash title. I doubt I’ll stick with it, but there was just something to the notion of Star Trek vs. Transformers that has me curious enough to at least get the first issue. Spawn‘s been an ongoing thing for me for a couple/several years now, though I’m ridiculously far behind on actually reading. But as a $2.99 title, I feel like I’ve gotta support the price point, at minimum! And can’t beat $1 #1 issues for actual series, such as Oni‘s The Long Con. I wound up getting the entirety of Letter 44 (~35 issues) thanks simply to the first issue being $1 instead of $3.99. Marvel could CERTAINLY learn a thing or two from that sort of pricing scheme! This is an odd week. For one thing…it’s Marvel-heavy, which almost never happens–not for new issues, anyway. Secondly, I managed to initially flat-out forget to grab (or otherwise missed) a couple issues I’d specifically intended to get! I believe this week’s issue of The Mighty Thor is the final issue…well, for a few weeks, as we’re already getting another Thor #1 soon! Thinking it looks a bit standalone, and though I detest the $4.99 price point, it IS 12 more pages for “only” an extra $1 (compared to the 20-page $3.99 Marvel issues) I grabbed my second Thanos Annual #1 of the last several years. What can I say? It would feel odd not to snag the issue, given the movie that premieres this week! 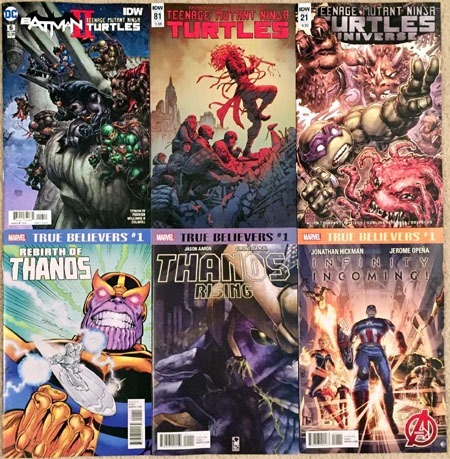 Of the various True Believers issues…I have to say that the Infinity Gauntlet #1 and now this Infinity War #1 are easily a couple of the best values given the size. And of course, I greatly enjoy that they retain their original logo and (mostly) original cover. After all…these are rather “iconic” covers, from some ancient time when variants were rare, and specific comics were actually recognizable BY their covers. The newest issue of The Terrifics is here, as is the final issue of the Demon: Hell is Earth mini (which is one less title to be picking up, slightly easing the monthly outspend). And of course, the newest issue of Previews…which at this point is just an odd catalog, with separate publications for Marvel and DC and whatever else is contained. 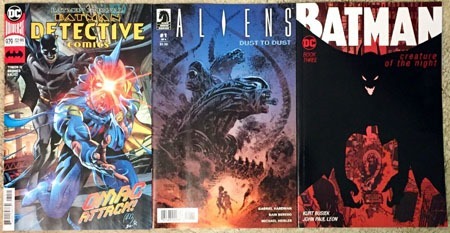 Somehow I missed Detective Comics for the week, as well as the start of the newest Aliens mini-series: Dust to Dust (and just before Alien Day 2018, to boot!). I also realized I’d either missed, or skipped, the newest issue of Batman: Creature of the Night. I feel like this issue was really late, and suspect the next of being the same…such that this has really lost some of its momentum for me. Once again, here it is the day before the next New Comic Book Day. 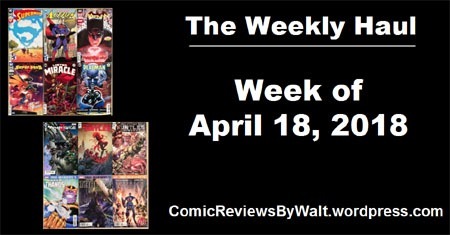 But then, I’m also getting used to a “schedule” of having Ultraverse Revisited posts on Monday/Wednesday/Friday…so the other couple posts of the week are balancing differently than once upon a time. Also some other stuff coming up that I should be sharing in the near future! Meanwhile…tomorrow is another Wednesday for new comics, and this upcoming Saturday is Free Comic Book Day at participating local comic shops! 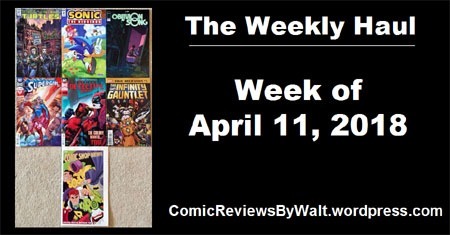 With my Ultraverse Revisited project in full swing, and throwing up a review for Action Comics #1000 last week, here it is nearly another New Comic Book Day and I’m just now getting to last week’s haul! 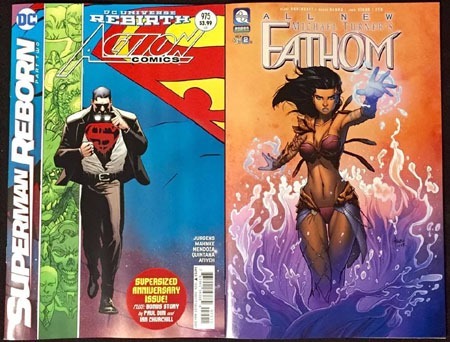 Because of the intentional delay/coordination for Action Comics 1000 to release for the actual 80th anniversary of Superman, we actually have two Superman books this week. I believe this is the final issue of this iteration of Superman itself, and we now have to wait for DC Nation and Man of Steel before the titles start back up in July. I’m way behind on reading Batman but was able to enjoy this issue quite well. It’s the first chapter of a story involving Booster Gold. And I’ll just say that Batman on the cover stating that Booster Gold must die? He’s got a darned good reason, though Booster seems a bit out of character to me for developments over the past 10-11 years or so that I’ve read/internalized. 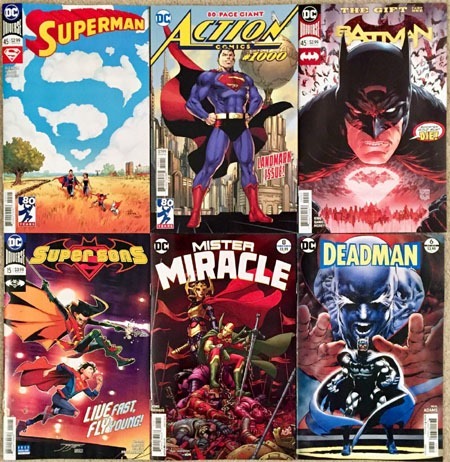 We also have the final issues of Super Sons and Deadman, as well as the latest issue of Mister Miracle…all three of which I have got to get caught up on reading! Big TMNT week for me, with Batman/TMNT II, TMNT Universe, and TMNT #81. And then several more of the True Believers reprints…basically the only way I’m intending to buy much in the way of “new Marvel” for awhile/at all. And I actually regret the Infinity Incoming, as that reprints an issue I regret buying in its original form! However, the Rebirth of Thanos reprints an EXCELLENT, nostalgic issue of Jim Starlin‘s Silver Surfer and I thoroughly enjoyed re-reading it this way. I’m also not overly keen on Thanos Rising, but enjoyed that digitally so this gives me a print edition now. 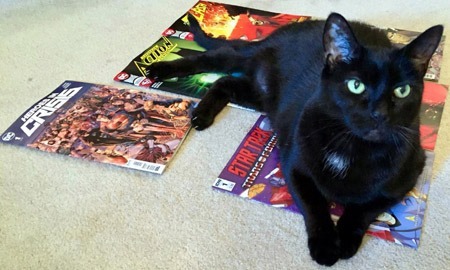 I’m hoping the new comics for April 25 aren’t too plentiful or expensive…but we’ll see how that works out! 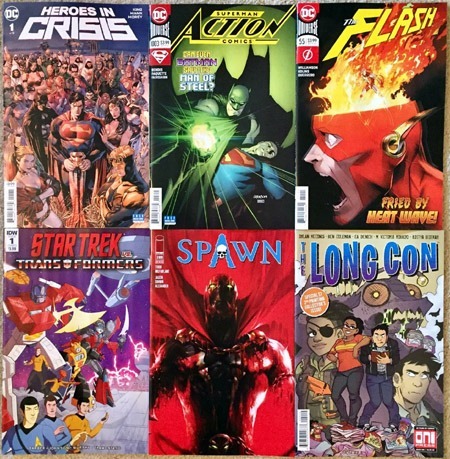 Thankfully, this proved to be another small-ish week for new comics! 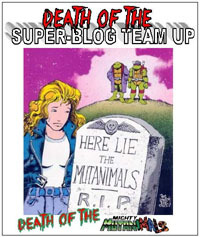 We have a new issue of TMNT, starting a new arc. I might be slightly “off” but it seems like IDW managed to FINALLY realize it is possible to do comics in longer-than-4-issue-arcs! Meanwhile, we have the 2nd issue of the new Sonic the Hedgehog…I remain skeptical of a WEEKLY $3.99 title. 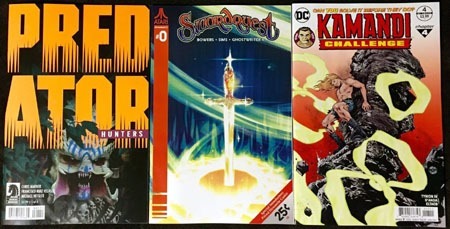 However, for a launch, I’m all for a quick succession of 4 issues–it gets more material out quicker, and gives a full (larger) arc in a shorter time, and while the “cost” to me is the same, without looking to the hassle that weekly titles are to comic shops, it gives me a chance to have several issues to decide if I want to continue with the series…without the question being dragged out for months. We also have the new issue of Oblivion Song (I reviewed the first issue here) which I’ve pretty much lost interest in and haven’t experienced any “hype” for its SECOND issue (yet again where “only” the first issue/premiere of a series is pushed and then left to sink or float on its own while the “next big thing” is actively over-pushed). Then we have what I think is the “final” issue of Supergirl (well, this current iteration anyway. Given the hit tv show, I can’t imagine there not being some sort of comic series going for it). And of couse, far behind as I am in the reading, the latest issue (again? Already?) of Detective Comics. Finally, a True Believers reprint of The Infinity Gauntlet #1. From 1991…a 27-year-old comic that back then was “just comics” doing some gratuitous cosmic crossover and now is a multi-billion-dollar basis of movies. Though I’ve gotten copies of this issue from 25 and 50-cent bins in the (“distant”) past…this is certainly the cheapest way I’ll acquire any new copies. And on shinier, cleaner paper, possibly with “cleaned-up” colors/restorations…and certainly the (print copy) “convenience” of the issue, without digging through all my unsorted longboxes. Plus…it looks like this 2018 edition reprints the ENTIRE ISSUE. The 2015 edition (around Secret Wars) did not–as I recall–give the entire issue. Next week will have the issue that–in nearly 30 years of being into comics–I’ve waited the longest for; having looked forward to it for some 23+ months: Action Comics #1,000. And really, in a way I’ve been looking forward to it for over 350 months…since my first issue of the title as a new comic, waaaaaaay back with #651! 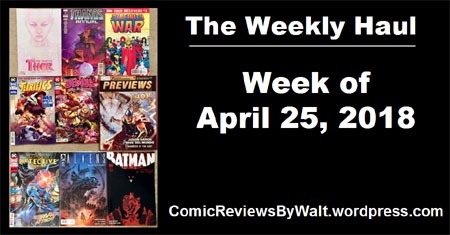 This ended up being a "decent’ week of new comics–not horrendously expensive, but not all that small or cheap, either! But a bit of a spread on stuff I’ve been looking forward to, stuff I continue with, and some new stuff. Though it would have included Youngblood #1…except–thanks to all the variant covers–the "advertised" cover on the Image website was NOT available. Since I couldn’t get the advertised (and thus assumed to be "standard" or "basic" or "CVR A" or "regular") I did not buy the issue at all…and they lose any chance of my buying into nostalgia and trying any further issues. For screwing around with variants, they lose me entirely. This week sees part 3 of the Batman/Flash crossover The Button. A new Superman issue. Though I don’t plan to follow all 12 issues offhand, curious about the Bane: Conquest series, and the cover having a familiar-ish font for the logo and iconic look in itself as an image. 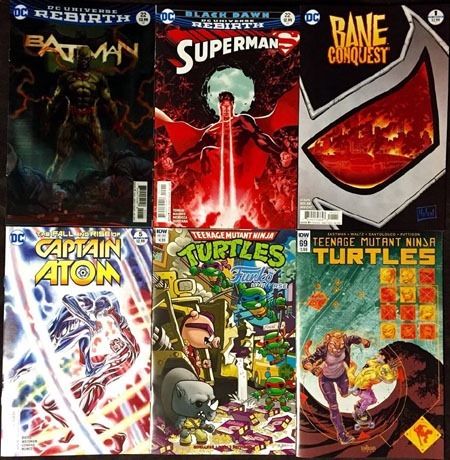 New Captain Atom…and a couple new Ninja Turtles! I am ESPECIALLY happy to see the return of the "classic" ’80s TMNT logo on the Funko Universe issue. E, after even the "classic" toys line adopted a "corrupted" form to make it look more like the newer branding! Having just last weekend "caught up" on the Life and Death mega-arc through the AvP properties, I’m rather keen for more all around, so definitely welcome this new Predator series. I missed the Kamandi Challenge issue last week. And as to Swordquest….twenty-five cents. Not about to pass up that one…all the more with my nostalgia-factor kicked into high gear lately on stuff after listening to the unabridged audiobook of Ready Player One (and presently being "on the hunt" for War Games to watch for myself!). No bargain/back-issues this Wednesday, no collected volumes. 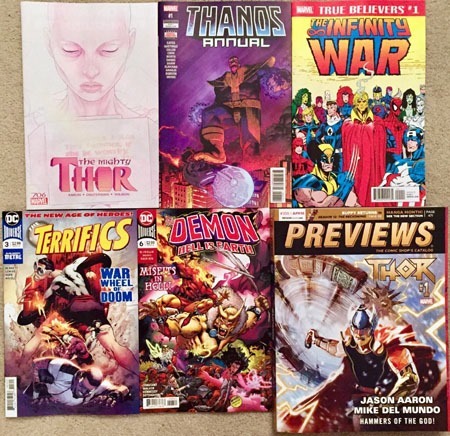 We’ll see what’s waiting at week’s end…and Free Comic Book Day…and of course, the new Guardians of the Galaxy movie premieres tonight/Friday. 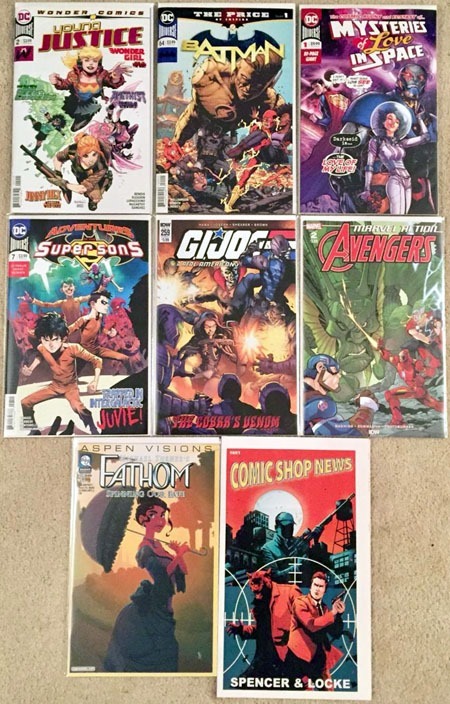 This week was a pretty small week for new comics for me: only two new issues! We’ve got the second chapter of Superman: Reborn in Action Comics #975 (a 38-page issue for only $3.99!). And the second issue of Blake Northcott‘s All New Fathom. 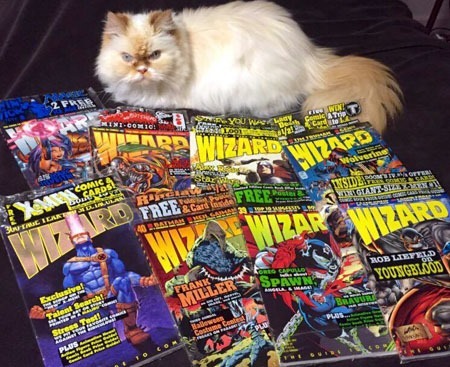 Along with the new issues, I noticed a couple of familiar-in-style polybag tops sticking out of the $1 bins…upon investigating, they were indeed issues of Wizard! For being only $1 apiece, I snagged all 8 issues present, figuring I’ll at least enjoy opening them and going through the goodies that came with them…as well as "replacing" posters long since ripped out and lost. Ziggy was curious what I was doing, so got himself into the photo. A nice little bonus, no? And because I totally forgot to do it from last week, below I’ll cover last week’s haul.